Water filter cartridges for in line applications. A variety of uses. Small line refrigerator filters to large line full house cartridge water filters. Water filtration for the removal of sediment, dirt and sand. The package comes complete with heavy duty cartridge housing that will last for years, a filter wrench to make filter changes a snap and a 10" x 2.75" five micron filter to give you clean trouble free water. For higher flow rates take a look at our Hi-flow packages. COMPLETE GIGANTIC 20 INCH SEDIMENT WATER FILTER $49.87. An affordable way to remove chlorine, taste, smells and other chemicals from your water. These 10" filters will fit in small spaces and comes with a wrench to make installation and filter changes easy. Carbon filtration has been used for many years in water treatment and is great at improving the quality of chlorinated water and these low cost filters make this easy and affordable. All packages include the housing unit, initial filter and filter wrench. Filters for chlorine, taste, smells and chemical removal. 10"Crypto-Giardia .5 Micron Filter 3/4"
IN LINE DISPOSABLE Refrigerator and small line filters: Add them to any 1/4" water line. Installs in seconds. Water filter cartridges are an inexpensive way to remove impurities from your water. 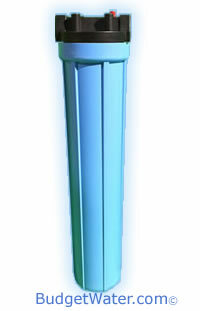 We have sediment cartridges in both the standard and high flow sizes. These can be custom fit to virtually any micron size water filtration you need. We also have the carbon filters in both standard and high flow sizes as well. 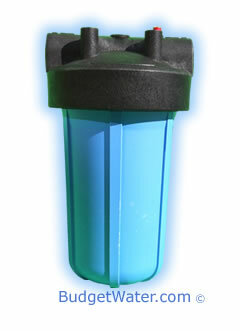 The carbon filter is great at removing chlorine, tastes, odors and many other chemicals and contaminants. And, these are an excellent choice to use on city water applications with or without a water softener. For larger sediment issues, please see our Heavy Turbidity Backwashing Filters. For backwashing carbon tanks, please see our Carbon Tank Page.